It’s a common misconception that the only Korean side dishes involve some variant of rice, tofu, and kimchi. Here’s a look at some of the others. No meal is complete without the right sides! If you’ve ever eaten at a Korean barbecue restaurant, then you’ve probably tried the small plates that come out before the meat is ready. It’s a common misconception that the only Korean side dishes involve some variant of rice, tofu, and kimchi. Here’s a look at some of the others. When it comes to Korean side dishes, this is the quintessential one. It’s hot, it’s spicy, and it’s quite tasty – unless you don’t enjoy how hot and sour it can be. The sourness comes from the fermentation process used to achieve the iconic taste of kimchi. Napa cabbage is seasoned with garlic, ginger, and red pepper, but it may surprise you to know that this isn’t the dish’s final form. Cucumbers are cut into thin slices and used as a vehicle for kimchi paste. 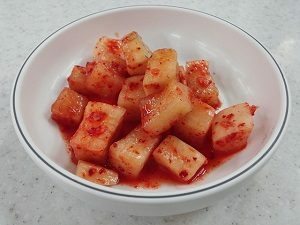 Kimchi can also be served in radish cubes instead of cabbage or cucumber. This dish is a bowl of mung beans sprouts. Once marinated, they are combined with salt, garlic, and some sesame oil. You can ask for it to be topped with cucumbers, although this is optional. If you’re enjoying this alongside the kimchi, though, the coolness of the cucumbers might come as a welcome relief. Do you like anchovies on your pizza? Even if you don’t, this is a different take on the tiny fish that you might find delightful. These dried anchovies are stir-fried before they hit the table, and they’re extremely popular in Korea. It’s sweet and salty all at once, thanks to the honey, sesame oil, and garlic that it is often drenched in. Speaking of sweetness, if you want to try something sweeter, choose yeongeun jorim as one of your Korean side dishes. It’s a lotus root that is prepared in a sweet soy-based glaze. Alternatively, it can be candied as well. It’s something different if your taste buds are up for a challenge! Our old friend japchae is here again. Although it can be served as a delicious entree, a smaller serving counts as one of the tastiest Korean side dishes you’ll find anywhere. Sweet potatoes, sesame oil, meats (such as bulgogi) and veggies all come together to create something magical. This entry was posted on Friday, September 28th, 2018 at 11:03 am . You can follow any responses to this entry through the RSS 2.0 feed. Both comments and pings are currently closed.